Black Holes, Quarks, Hubble, Neutrinos, this would have sounded like a foreign language back in 1951 when a small group of people with a common interest and a vision of the future met at the Central Library with a view to forming an astronomical society for Wolverhampton. It was at that meeting that the Wolverhampton Astronomical Society was inaugurated and the society has been meeting regularly ever since and has witnessed and, indeed, followed, the tremendous advancement in the science of Astronomy. In 1951 the idea of the exploration of space was the science fiction of the day but even in those early days the Society was envisaging and forecasting big strides forward in Astronomy and in October 1957 with the launch of the Soviet satellite Sputnik 1 that first step was taken and some members of the society have been observing and monitoring satellites ever since. The moon landing was the next big milestone; a prime example of how rapid technology was developing. Such events always tended to increase membership of the Society. At the time there was, and still is, a lot of criticism of the amount of money that space exploration costs, and whether or not the money would be better spent but there are very many aspects of our present day life especially, in the field of medical science that are a direct result of space research. A major aspect is the need to get an awful lot in a small space and this gives rise to heart pacemakers, keyhole surgery to name just two. Like most other societies funding was, and still is, a major problem. Wolverhampton Astronomical Society, being totally self funding, it is always difficult to balance the subscriptions to offset the running costs and the major item of expense has always been that of hiring rooms in which to hold the meetings. Hence in the 50 years we have moved a few times. In its early days the Society meeting were held at various locations such as school rooms and at one stage we met in Wulfruna Street in what was then called the Technical College (now University) but the bell-ringers' practice night at St Peter’s Church caused problems - but of course the Church was there before the Society. The Society then met at 38 Tettenhall Road in the mid 1960s and was there for some years and we have now been at our present venue: Beckminster Methodist Church Hall, Birches Barn Road for a considerable number of years. But in the interim meetings had been held at Old Hill, Tettenhall and Springfield Road. Getting ready for a public meeting. In the late 1960s the price of an astronomical telescope was quite high and quite often out of the price range of most amateurs and so the answer was to build the structure yourself from whatever scrap was available. You then had to consider the optics, and these were very expensive. A mirror, 8 inches in diameter and about 1 inch thick and made from low expansion glass such as Pyrex, could be purchased at a cost of about £500, which of course in the 1960s was a lot of money. After that you still had to consider the secondary mirror and eyepieces, all of which added to the cost. So not only did amateurs of the day construct the hardware, they also tackled mirror grinding, that is, taking suitable blank Pyrex discs and grinding out a concave in one to very accurate measurements, sometimes to a thousandth of an inch. Several members of the Society did this and constructed very effective instruments. Telescope tubes could be made with electrical conduit tubing and a series of pram wheels to make an open skeleton tube to house the optics, just one of the many varied designs for telescopes. Pram wheels were quite an effective solution but, whilst the Society did not resort to hi-jacking prams, we did buy over 50 wheels from a Black Country manufacturer of prams, because they were rejects, maybe the chrome had not taken other some other fault. But that did not concern the telescope builder. 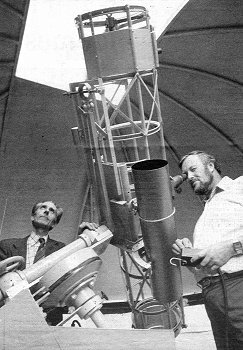 Malcolm Astley (left) and David Harris (right) with their home made telescope. 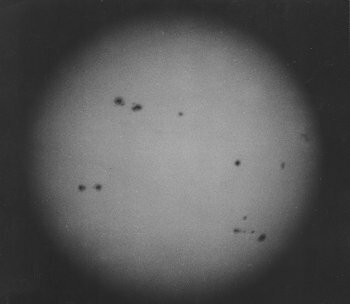 Sunspots, June 10 1979, 15h 18m GMT, taken by a member. However as time went on technology started to overtake and astronomical telescopes, made by specialist companies, started to become cheaper and people's disposable income started to increase. The art of telescope making has receded somewhat. Today telescopes have become very sophisticated and instruments with computer controlled systems that enable the observer to locate any object in the night sky by simply keying in the known co-ordinates, Right Ascension and Declination, are well within the range of the serious amateur. Such telescopes need, of course, an observatory, even though that may be in your own garden. But it is impractical to simply take the instrument outside for view, it has to be carefully aligned and this can only be achieved in an observatory. A Society observatory is quite another thing. Various attempts have been made by the Society to try to come up with a solution but the cost is totally prohibitive. Such an observatory would have to be sited away from light pollution. This is a problem in itself as it means being out of town but still accessible to members. The cost of land, either to purchase or lease, together with planning permission, electrical supply, water supply, security fencing etc. etc., the requirements and costs become almost endless. And when one looks at the number of clear nights suitable for observing it would probably be underused. The idea of renovating existing structures has been considered in the past. One was at The Cedars, Compton Road, which was at one time the home of the Butler family (of local brewing fame). There are the remains of an observatory there, but again no funds were available from any source. In 1952 an approach was made to Lord Wrottesley of Wrottesley Hall, with a view to trying to bring back into use a large observatory adjacent to the Hall, but unfortunately it was in a bad a state of repair and really beyond recovery. Wrottesley Hall is not within the Wolverhampton borough but, under Section 34 of the Wolverhampton New Waterworks Act 1855, it was decreed if any steam engine, furnace chimney or other apparatus generating, producing or transmitting smoke was built by the waterworks company within three miles of the observatory, it shall be constructed on the best and approved principles "for burning and consuming the smoke arising or proceeding therefrom". 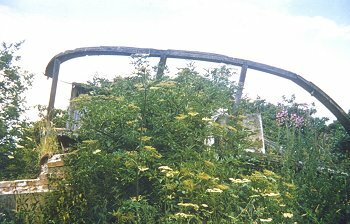 The ruins of the observatory at Wrotteseley Hall, photographed in 1961. The ruins are in the grounds of the estate near The Foaming Jug. This of course was so that observations from the observatory would not be hampered by smoke pollution. John (later Lord) Wrottesley was born in 1798 and became a founder member of the Royal Astronomical Society and he did an enormous amount of observational work at his first Observatory in Blackheath, London. He recorded over 12,000 observations and in 1839 was awarded the RAS’s Gold Medal Award. In 1841 his father died and John inherited the title and the Staffordshire family estate at Wrottesley and he resolved to build an observatory there - which he did - and again to take up serious astronomy. The coordinates of the Observatory are 52 degrees 37 minutes 23 seconds North and 2 Degrees 13 minutes 24 seconds West and are, of course, very important for observational work. John Wrottesley died in 1867. Brinsford Lodge, near Essington, was a hostel complex for overseas students and prior to it being demolished we were able to have a room there and did for a short while, have a large telescope installed. In 1993 the Society hosted the first ever convention in Great Britain of the International Union of Amateur Astronomers at the Compton Park Campus of the Wolverhampton University when we attracted astronomers from all over the world, including Japan, Australia, South Africa and many European countries. A full week of events was arranged with professional astronomers giving lectures and a special visit to Jodrell Bank was included. The Convention was huge success and the Society received many congratulatory letters from participants. 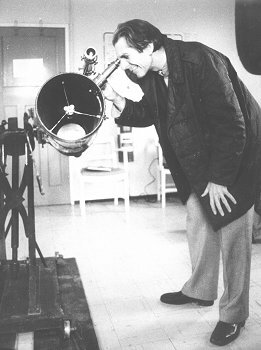 Malcolm Astley, then as for many years the Secretary, checking the telescope. Astronomy is a science in which the amateur can still make a significant contribution in certain fields and professional astronomers welcome the amateur involvement. Professional telescope time is very expensive indeed and the professionals still rely to some extent on the amateurs, who constantly patrol the skies, pursuing their favourite aspect of astronomy, to alert them of anything unusual.